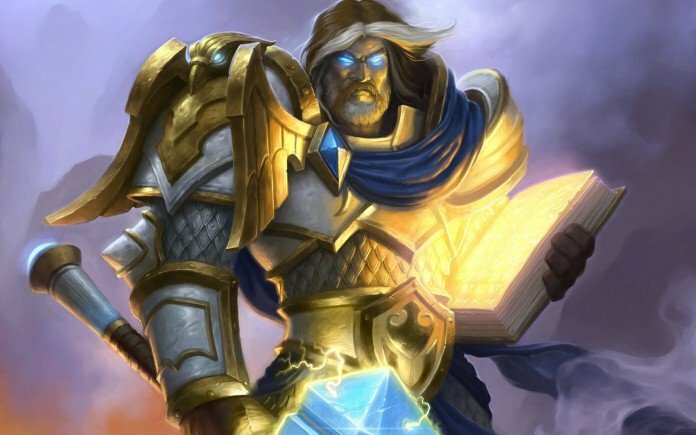 Of all of the changes that The Grand Tournament has made to Hearthstone, the biggest impact can be felt with the Paladin class. Not only has Paladin become one of the strongest classes, there is an incredibly wide variety of ways that Paladin can be viable. Whether it’s aggro, control, secrets, dragons, or murlocs, Paladin has plenty of ways to stay competitive. Paladin has also been one of the strongest classes in Arena since the beginning, and TGT has only made it better. There’s simply no better time to be a Paladin player and you have plenty of options to make the class work. With the amount of Hearthstone expansions growing more and more, I’m going to specify where you can find which cards. That way, you’ll know where to aim your attention for finding the cards you need most. I’d also like to give shout-outs here to Dragon Consort and Eadric the Pure, both of which I’ve covered in previous articles and having nothing new to say. With that out of the way, these are the Paladin cards you need most in your collection. At a glance, Seal of Champions doesn’t look like that good of a deal. Essentially, it’s just Blessing of Might and Divine Shield put into a single card for one more mana. However, the simplicity of pooling effects into a single card isn’t something to overlook. While Blessing of Might is better for aggro decks and Divine Shield is better when you just really need to protect your minions, but Seal of Champions is the best in general. Putting your buffs into a single card makes them more viable as you have less of a need to draw through your deck for them and can instead focus on fitting in more minions. The trickiest part about buff spells is that you need minions to already be in play in order to use them, so building a deck with a lot of buffs can easily leave you with a dead hand. 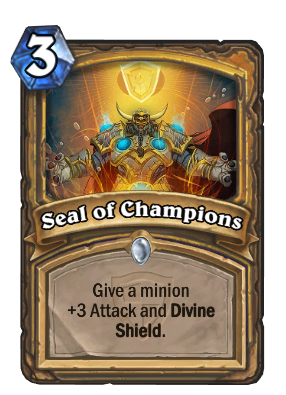 If you have a deck where both Blessing of Might and Divine Shield can be useful, using Seal of Champions in their place gives you more consistent results and frees up two spots in your deck for minions you can actually cast said buffs on. Blessing of Kings is also good for a lot of the same reasons, but Seal of Champions just edged it out for this list. Peacekeeper can be a lifesaver in a pinch by making massive threats into minor annoyances with ease. While the Humility spell has the same effect, the 3/3 body really does make a world of difference. Having a body on the board is almost always better than not having one, and a 3/3 for 3 mana is pretty standard. Despite being a junior-version of Eadric the Pure, Peacekeeper is actually better in a lot of ways. Unless you’re against a Handlock deck, there’ll generally only be one big threat on the board at a time that needs to be addressed at a time. As such, Peacekeeper is a very flexible option for neutralizing late-game muscle. He also works well with Stampeding Kodo to quickly clear a big threat while also building board presence. 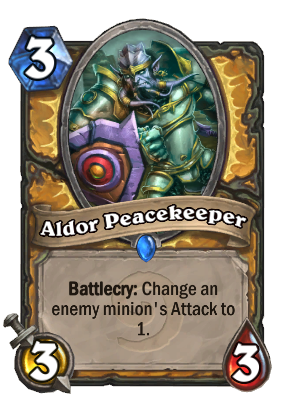 Admittedly, the current meta has shifted away from the Peacekeeper/Kodo combo making an impact, but it is something to keep in mind just in case a meta shift makes cards like Ysera and Chromaggus into auto-includes. Paladin secrets have always been fairly underwhelming. It makes sense given that they all only cost one mana, but they’re generally hard to justify given how little an impact they often make. Take note that not even a single one of those secrets managed to make this list (although, Avenge was pretty close). However, if you combine all of the Paladin secrets and have them all in play at once, you’ve suddenly placed your opponent in a serious bind. 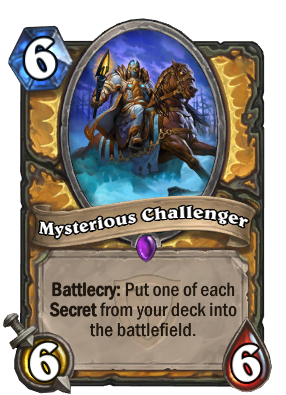 Enter the Mysterious Challenger, a powerful 6/6 for 6 minion that brings one of every secret in your deck into play. Granted, some secrets still aren’t worth playing even with his effect (Eye for an Eye), but many of them work extremely well when combined for an aggressive build. The ability to pull expendable cards directly from your deck and into to play makes your future draws much more reliable. Naturally, he also pairs extremely well with Secret Keeper as she gains +1/+1 whenever a secret is put in play and can quickly become massive with this type of deck. Being able to wipe the board in a pinch is vital for keeping a game in your favor. For Paladins, that often comes with Equality, a very potent spell with a few drawbacks. 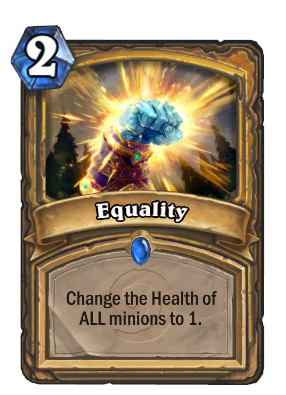 Equality has little effect on it’s own and must be paired with other cards inorder to actually remove minions. However, when combined with something like Wild Pyromancer or Consecration, it can easily wipe an entire board of massive threats. Even having a few Silver Hand Recruits ready on the board can be enough to take out major minions. The other big concern is that Equality effects your own minions just as it does your opponents, so you have to be careful about when you use it. Play it recklessly and you can end up doing more damage to yourself than your opponent. Make sure you have a follow-up plan reserved for after you play Equality as the minions you have out when you cast it will not last long. When it comes to controlling the board, a well-timed Equality can be a linchpin. This card is so good in so many ways. Calling in a handful of weak minions and equipping one of the worst weapons in the game doesn’t sound like a great deal, but the amount of board control it gives you is incredibly strong. Having any bodies on the board gives you command over the game and more minions give you more options. When you need to be aggressive, a bunch of small minions from one card gives you a lot to pressure with while your opponent needs to take their time to clear it. When you need to control the board, the weapon gives you a quick swing to take out weak links while the recruits can be buffed with cards like Seal of Champions and Blessing of Kings down the line. 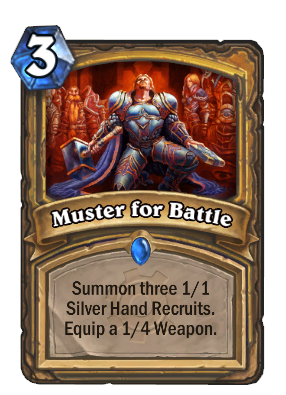 The Silver Hand Recruits can also be made more viable with cards like Quartermaster and Warhorse Trainer, which aren’t viable without this card. The one thing you need to keep in mind is when your opponent has the ability to clear the board with AoE cards that can wipe your recruits in a flash. Aside from that, Muster for Battle is a highly reliable card. 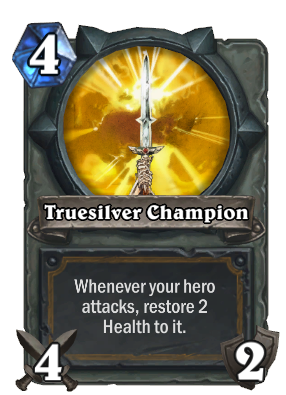 Truesilver Champion is easily one of Paladin’s best cards and it’s free! What makes weapons great is that they can quickly take out enemy minions while posing a threat for the next turn. Also, the higher the attack power, the better, as it opens up more targets for a one-shot. The one downside is that your hero takes recoil damage from any minions you attack and that puts you at risk if you don’t defend yourself from going over the edge. Truesilver not only deals a lot of damage, but it also heals you each time you take a swing with it. It is a monster of a card in Arena and works well with a number of constructed decks, though not all of them. When you’re getting your start with Paladin, few cards will be more reliable than Truesilver and it will remain with you for many future builds. From Annoy-0-Tron to Sunwalker, any minion with divine shield and taunt on it automatically gives you a great deal of control over the game. While you can’t target which minion will receive the effect, carefully planning out your plays can give you better odds and there are few minions that are made worse by its effect. If used in the late-game, you can easily set the board for one of your biggest minions to take the effect and act as a formidable defense. In the early game, the weapon alone gives you immediate control over the board with whatever taunt you just created to hold the line. 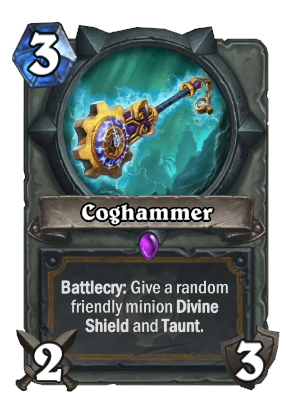 Basically, Coghammer is always a powerful play and a steal at only 3 mana. 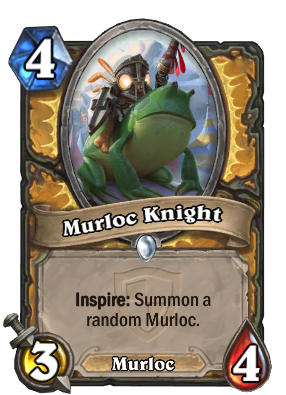 Paladin has always been one of the best classes for murlocs, and Murloc Knight has made it the definitive class. While a 3/4 for 4 mana is sub-optimal, it’s still good enough to stand on its own. That makes it’s ability to spawn more murlocs whenever you use your hero power all the more viable. While there is a great deal of randomness involved in what murloc you get and murlocs are weak on their own, they draw a great deal of strength from each other and constructing a full murloc deck with Murloc Knight is incredibly powerful. One Murloc Knight can even spawn another one and subsequently snowball into insanity. Oddly enough, Murloc Knight is also extremely good in Arena (noticing a trend?). Normally, tribal synergy is not reliable in Arena as you can’t rely on getting enough cards in the tribe from your draft, but Murloc Knight is still great just for its ability to get bodies on the board. Even without any other murlocs in your deck, Murloc Knight can bring all of the murlocs he needs on his own. 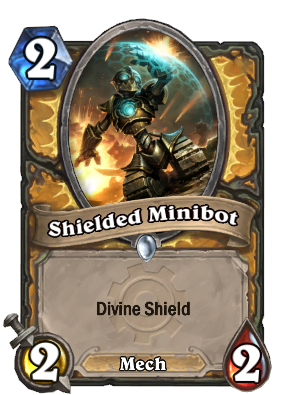 Even if you’re not running a mech deck, Shielded Minibot is still a great inclusion for any deck. What’s important about Minibot is the amount of tempo it can give you in the early game. Because it has divine shield, it takes a great deal of commitment from your opponent to trade favorably with it, such as having to spend mana on their hero power rather than getting out minions to contest the board. Meanwhile, your giving up next to nothing to play the Minibot yourself. It can usually take out at least two enemy minions on its own and secure an early lead for you. The only minions that really counter it are Blood Knight, which is rarely used, and Flamejuggler, which requires some good luck to work. As for late game, while it’s certainly not the ideal card to topdeck, it is one of the better 2-drops out there as it still secures something of a board presence that isn’t easily cleared. It may look like a humble card with only a 2/2 stat line, but that’s all it needs to work wonders. To finish things off, we have Paladin’s best legendary and one of the best legendaries in the game overall. If you ever have a chance to pick up Tirion in Arena, you ALWAYS pick Tirion over literally anything else as he is the single most powerful card in that game mode by a country mile. In constructed, he’s a powerhouse in control decks. Once again, taunt and divine shield are a powerful combination that give you immense control over the state of the game. Combine that with a 6/6 body and you have a powerful protector. Even when he does go down, he leaves you with his Ashbringer weapon to ensure you keep control of the rest of the game. It’s like having a better Truesilver Champion for free. The one weakness of Tirion is silence, but he can still shrug it off well enough with his strong stat line. 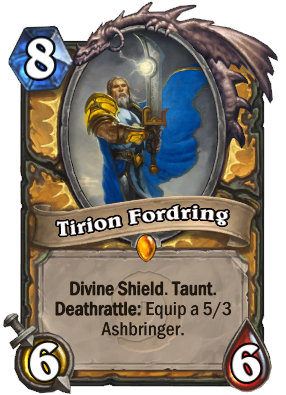 As always, Tirion Fordring is a champion for all. Honorable mentions go out to Consecration, Sword of Justice, and Tuskarr Jouster. Those are great cards in their own right, but I can only feature so many cards in one article and those just barely missed the cut. Also, before seeing all of these great Paladin cards makes you craft a Grand Crusader so you can get them with any class, I should mention that there are just as many extremely weak Paladin cards as there are extremely strong ones. As for actual Paladins, it’s one of the easiest classes to jump into right now. Dragon decks can be costly given how rare many of the dragon cards are and a secret deck can take some time to put together because of Mysterious Challenger being an epic and Avenge being locked at the end of Naxxramas, but aggro and murloc decks are very easy to build without much investment. Which is your favorite archetype for Paladin and why? Leave a comment below and let us know what you think.